My family loves to play games together and the perfect time to enjoy new games is throughout the holiday season…..especially to keep the fun going at holiday parties and gatherings! From the makers of the popular game, Rollick! The Game Chef brings us another fun, exciting party game that will be perfect this holiday season called Long Story Short. 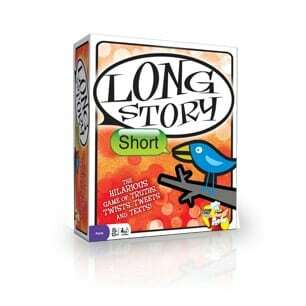 Long Story Short is not only fun to play but it is designed to bring about lots of hilarious laugh-out-loud responses as players have a blast trying to create the best short story. How do you play? For each round of Long Story Short, a Storyteller will use a fun story starter from the playing cards and tells a story that is either true or false. The other players then try to make this long story short by creating a headline, drawing a picture, writing a text or crafting a tweet. Recommended for ages 13 and up this is a game that the entire family could enjoy and it is unique to other games because it includes social media. My children are ages 8, 7 and 6 and with a bit of modification for the story starters even they were able to get in on the fun. It is a great way to encourage them to use their creativity and develop their story telling skills. The story starters are unique and interesting with examples such as “I had to get stitches because…..,””While visiting a National Park,” “I once spent a night in a haunted house” and “Someone called the police because…..”. Long Story Short includes everything you will need to play this game at your next party as well as many future gatherings including 104 story cards, 416 story starters, 8 suggestion cards (acronyms/emotions), 1 die, 1 scorecard, 8 storyboards, 8 dry erase markers and blue, red and white chips. For those who love to use technology in their games, players are encouraged to actually write a tweet or text message which can be sent directly to the Storyteller! The Game Chef games including Rollick! and Long Story Short are available online at Amazon.com and other retailers as well as at specialty toy stores. You are invited to visit The Game Chef to learn more about these fun, entertaining party games! 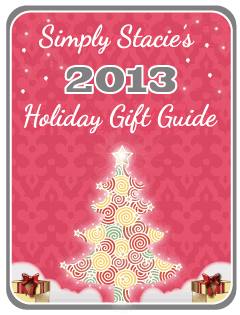 These games are sure to be a hit at your next party or would make wonderful hostess gift ideas. Rollick sounds like it would be fun if you had a big group! Id like to play the Rollick! I’d like to play ROLLICK! Rollick looks like a good game as well! This would be a good game for my older son, while my daughter would really like Long story short. I would like to play Rollick! I would love to also play Rollick! I would love to play Rollick! Rollick looks like it could be a fun addition to family game night! Rollick also looks like a lot of fun! Rollick is a game that we would all love to play!! Rollick looks like a lot of fun and would appeal to everyone in the family. I would have fun playing Rollick with my older kids too. I would love to play Rollick because its a Team game. i would like to play the game rollick! I think I’m like everyone else. Rollick looks like a lot of fun! I would love to try Rollick! I would also like to play Rollick! I would like to play Rollick. My daughter would like the game ROLLICK!. Sounds like a lot of fun. Rollicking looks to be a lot of fun too. Thanks for the chance to win. I’ve learned that from the looks of it, they only have two games for sale so far! Rollick! is the only other game listed.